Sleep is when the body is supposed to relax, allowing it to wash away the stress from the day and to engage in healing of the mind and body. However, according to the National Sleep Foundation, nearly 2/3rds of Americans are not getting highly restful sleep on a regular basis. This regular lack of calm rest can result in health problems, high stress levels, increased anxiety, and negative social interactions. Creating the right sleep environment is one is the simplest ways to promote more restful sleep. One of the more effective ways to create this environment is by changing your blanket from a standard blanket to a weighted blanket. Are There Other Healing Benefits? Is a Weighted Blanket Safe for Children? What is the Proper Weight? Is a Weighted Blanket for Me? Quite simply, a weighted blanket is exactly what you expect it to be based on the name. A weighted blanket is nearly identical to a traditional blanket, except that it ranges in weight from 2 lbs (for very small blankets) to up to 30 lbs. The exterior of the blanket is made from exactly the same materials that traditional blankets and comforters are made from. Most are usually cotton and just like standard blankets, they are available in a wide range of colors and designs, allowing them to match the design aesthetic of your bedroom furniture. The extra weight comes from polypellets that fill the inside of the blanket, where a soft cotton fill would be for a traditional blanket. These non toxic plastic pellets are safe and create a comfortable layer both for sleeping on and under. Are you a Candidate for a Weighted Blanket? The primary benefit of weighted blankets comes from grounding. This is the term given to the process of pushing your body down during sleep. In many people, this process creates a deeply calming effect that reduces nighttime stress levels. Reducing nighttime stress levels is beneficial for everyone, but it is particularly beneficial for people that suffer from anxiety. One of the common causes for anxiety is elevated cortisol levels. These levels are supposed to drop while sleeping. However, if your body believes it is under attack while sleeping, it can produce cortisol while you sleep. For roughly 2/3rds of people suffering from anxiety, grounding reduces or negates the fight or flight reflex that they experience while sleeping. This normalizes cortisol levels upon waking, greatly reducing any feelings of anxiety. In addition to grounding, a weighted blanket can provide another helpful healing benefit. When sleeping under a weighted blanket of the correct weight, a weighted blanket can simulate deep pressure touch. Deep pressure touch is a type of therapy, similar to massage therapy, that uses firm pressure to reduce anxiety and chronic stress. 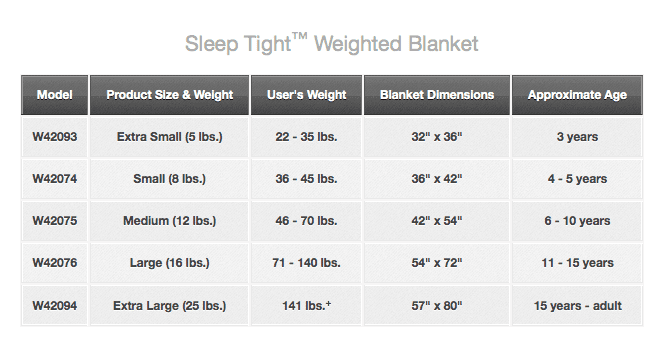 A weighted blanket can effectively provide that deep pressure touch therapy all night long. In some sleepers, this simulated deep pressure touch results in the triggering of dopamine and serotonin neurotransmitters. Dopamine and serotonin are hormones that naturally produce good feelings. They directly combat negative feelings like depression, stress, and anxiety. This simulated deep pressure touch also provides a major benefit to another group of individuals. Weighted blankets are extremely helpful for people that suffer from sensory processing disorders, including most people on the autism spectrum. Deep pressure touch is a very common form of therapy for people suffering from a sensory processing disorder. It helps sufferers to focus better and makes it easier to process sensory inputs. This is absolutely critical for sleeping through the night successfully. A weighted blanket on the bed and another weighted blanket on a commonly used easy chair or couch will provide hours of calm that helps both the individual suffering from the disorder and the family of the individual. Assuming you choose a blanket of the proper weight, not only are weighted blankets safe for children, but they can easily be one of the best decisions you will ever make for your child, particularly if your child is on the autism spectrum. Children, whether on the autism spectrum or not, respond very well to the feeling of being held. A weighted blanket reproduces that feeling. This results in a simple calming effect. It can help reduce sensory overload for children on the autism spectrum, reduce or even eliminate bed wetting, and possibly end the need for a nightlight with a child that is afraid of the dark. Every individual responds slightly differently to the feeling of weight upon them. Even if you are the exact same height, weight, and gender as another person, you may respond better to a different weight of weighted blanket than the other person. In general, though, the best weight depends on two things: your age and your weight. For children, the rule of thumb is 10% of the child’s body weight plus 1 or 2 lbs. This usually results in a calm, high quality sleep. For adults, a slightly lower weight calculation is used, ranging from about 5% to 10% of body weight. However, as previously noted, other factors affect this as well. For example, individuals that suffer from a sensory processing disorder usually respond best to heavier blankets, potentially requiring a weight that is many pounds heavier than the standard recommendation. Including your doctor or therapist in the discussion of whether you should purchase a weighted blanket, and how much it should weigh if you do purchase one, is the best way to ensure that you get a blanket of the best therapeutic weight. In fact, it is entirely possible, depending on your medical needs, that your doctor might prescribe a weighted blanket, which means that not only will your doctor help you determine the weight, but your insurance may cover the cost of the blanket as well. A weighted blanket is not for everyone. For example, if you suffer from respiratory issues or have claustrophobia, you would want to avoid weighted blankets. In terms of medical issues, your doctor should be able to definitively tell you whether or not a weighted blanket is safe for you. However, when it comes to less tangible issues, the simplest way to determine whether a weighted blanket is right for you is to test it out. If you have a friend who owns one, you could try borrowing it for an afternoon or night. If not, you can partially simulate a weighted blanket by piling multiple blankets, comforters, and sleeping bags on your bed to determine whether you are comfortable sleeping under the added weight. While your doctor or therapist may, and in some cases should, have input, the final decision is yours. If calm sleep currently eludes you on a regular basis, a weighted blanket is a pharmaceutical free option that you should seriously consider to reduce stress and anxiety.